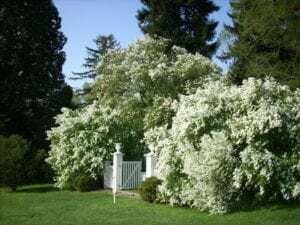 The information below is based on a typical year in the Winterthur Garden. Current bloom times may vary due to weather conditions. For up-to-date information, please visit our garden blog or call the bloom hotline at 302.888.4856. The first signs of spring have arrived with the blossoms of the white snowdrops and the yellow adonis. The cold weather brings out the best in the native and hybrid witch-hazels. At the Visitor Center, the lemon yellow Chinese witch-hazels contrast beautifully with the muted winter landscape. From the Quarry Garden bridge, the view of the surrounding hills is framed by the bronze shades of the hybrid witch-hazels. Now is a perfect time to visit Winterthur's March Bank. 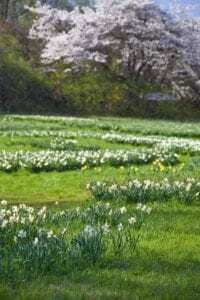 The hillside is covered with dainty snowdrops with their nodding white blooms and the winter aconite sporting its ruffle-like collar and cheery yellow flowers. 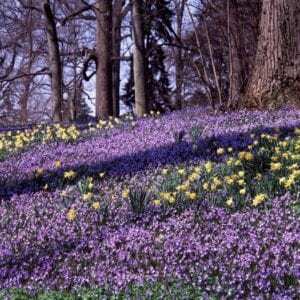 Among this sea of bulbs, look for the striking patch of adonis with ferny foliage and yellow blossoms. Around the Icewell Terrace are large white snowflakes making a show, and at the Visitor Center and Quarry Garden are witch-hazels still in bloom in shades of yellow and bronze. 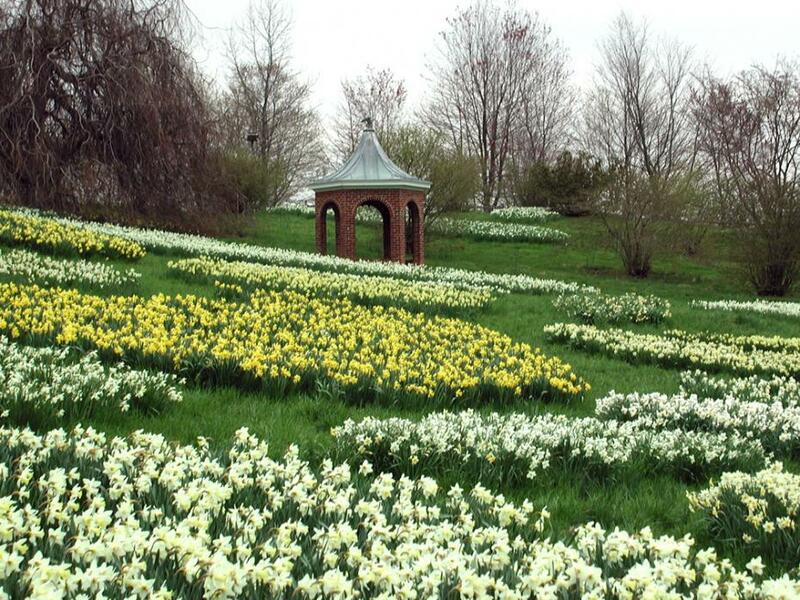 This week at Winterthur the March Bank is covered in white snowdrops and yellow winter aconite and adonis. This color scheme is accented by crocus in shades of purple and lavender. Blue glory-of-the-snow are beginning to bloom at the Quarry Garden along with yellow cornelian-cherry dogwoods. Chartreuse and pink hellebores are still in bloom along the Winterhazel Walk. This week in the garden, the highlight continues to be the March Bank. The "yellow phase" has just begun to fade as the bright yellow flowers of the winter aconite and adonis give way to the beginning blossoms of the blue squills and glory-of-the snow. These are accented with the yellow flowers of a Cornus officinalis, white and lavender crocus, and miniature daffodils. 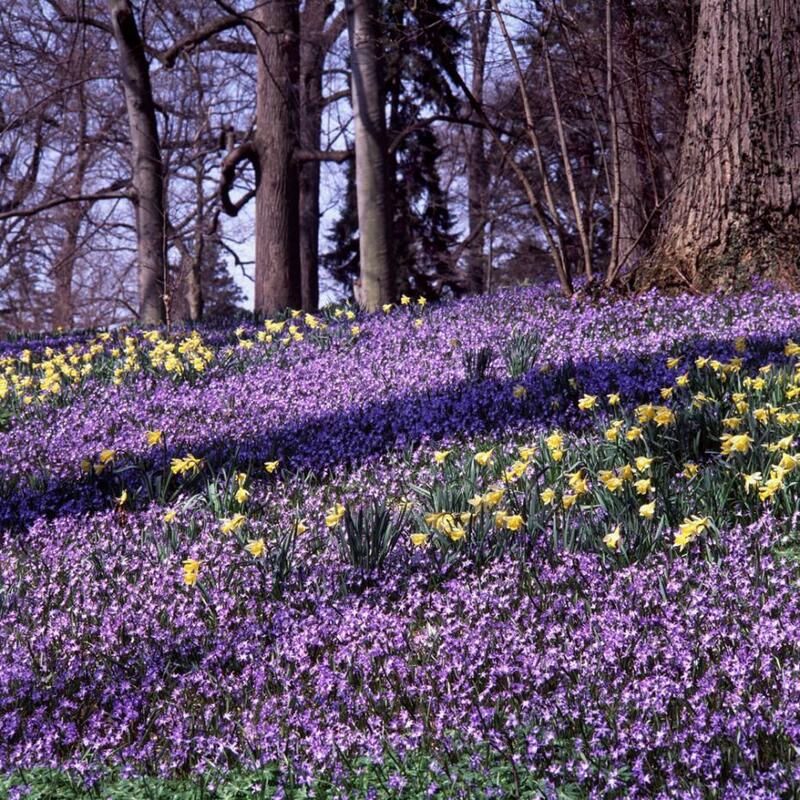 The crocus and daffodils can also be found at the Quarry Garden. Here there are three beautiful cornelian-cherry dogwoods in full bloom combined with the coppery shades of the hybrid witch-hazels and again the beginnings of the glory-of-the-snow. On your way to the Quarry, be sure to take the Winterhazel Walk and check out the burgundy and white Helleborus This time of the year the garden is constantly changing, especially as the "blue phase" of the March Bank begins. Taking center stage this week is the March Bank, which is in the midst of the change from the "yellow phase" to the "blue phase" with the beginnings of the blue glory-of-the-snow and squills extending from Azalea Woods through the March Bank and down into the Glade. There are also early miniature daffodils, lavender and white crocus, and yellow cornelian-cherry dogwoods in full bloom. The Winterhazel Walk has white, rose, and pale green hellebores, and blooming nearby are deliciously fragrant pink and white viburnums with early flowering rhododendrons beneath. At the Quarry Garden you can find yellow cornelian cherry dogwoods in bloom with yellow daffodils and blue glory-of-the-snow. The East Terrace lawn of the museum is filled with blue glory-of-the-snow, and nearby are fragrant white winter honeysuckle and yellow winter jasmine. It's finally here! The March Bank is at its peak with millions of scilla and glory-of-the-snow in full bloom. The sea of blue starts in the Azalea Woods, covers the entire March Bank, and spills down into the Glade. This bulb combination has seeded throughout the garden and is accented with the pale yellow of cornelian-cherry dogwoods, early forsythia, and daffodils. The other main display this time of year is the Winterhazel Walk, just coming into flower. The pale yellow winter-hazels and the lavender and pink Korean rhododendrons are just breaking bud along with the lavender corydalis and the white and burgundy lenten rose. With warm weather, the March Bank show will not last long, so be sure not to miss it! The garden is alive with color as we head into the month of April at Winterthur. The March Bank and Azalea Woods are still making a show with blue glory-of-the-snow accented by white and lavender Italian windflowers, white bloodroot, and cheery yellow daffodils. Winterhazel Walk dazzles with the beautiful combination of pale yellow winter-hazel and lavender Korean rhododendron. 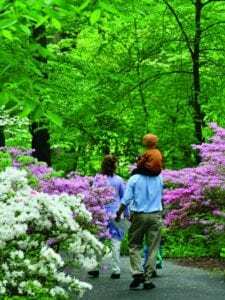 Take a walk to the Quarry Garden to see yellow daffodils and corydalis and to Azalea Woods to see pale pink rhododendrons. The Pinetum Quince Walk is in bloom with shrubs in various shades and blooming nearby is the pale blue starflower. 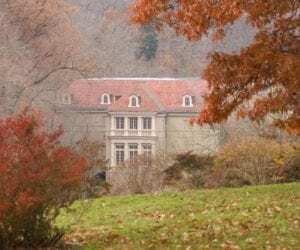 Throughout Winterthur, you can enjoy yellow forsythia and pink flowering cherries, pink and white magnolias, and beautiful stands of daffodils just beginning to color the hillsides. The garden is filled with color this week. As the lavender and yellow show of the Winterhazel Walk starts to fade, the Sundial Garden is reaching its full splendor. White and pink magnolias are in full bloom along with spireas, flowering quince, and flowering cherries. These colors can also be found in the Pinetum along with the pink blossoms of the royal azaleas. While in the Pinetum, don't miss the Quince Walk, which is lined with pink, salmon, white, and red varieties. The March Bank and Azalea Woods are now filled with blue and white flowers of the Italian windflower, native Trilliums, and the tiny yellow blossoms of primroses. Throughout the garden there are thousands of daffodils in bloom along with such spring treasures as early flowering rhododendrons, corydalis, native pachysandra, and many others. 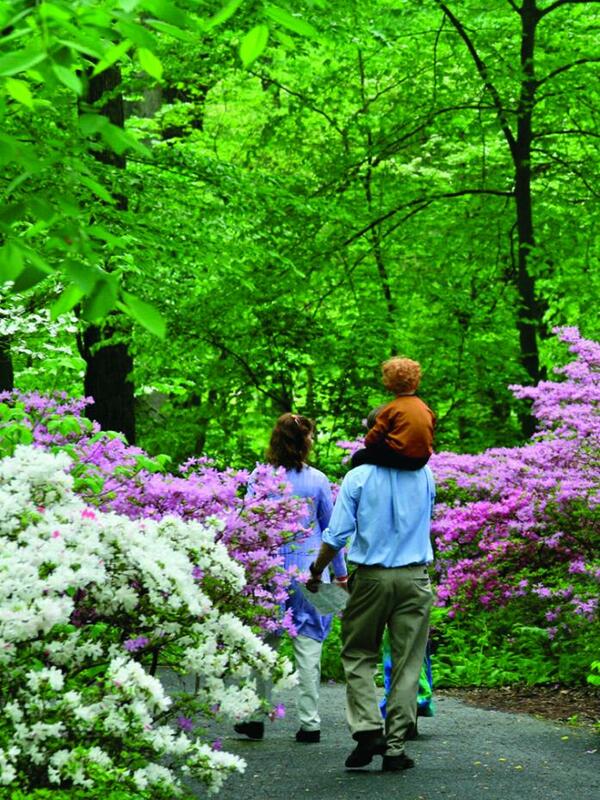 Now is the time to come to Winterthur and enjoy the early spring bloom. 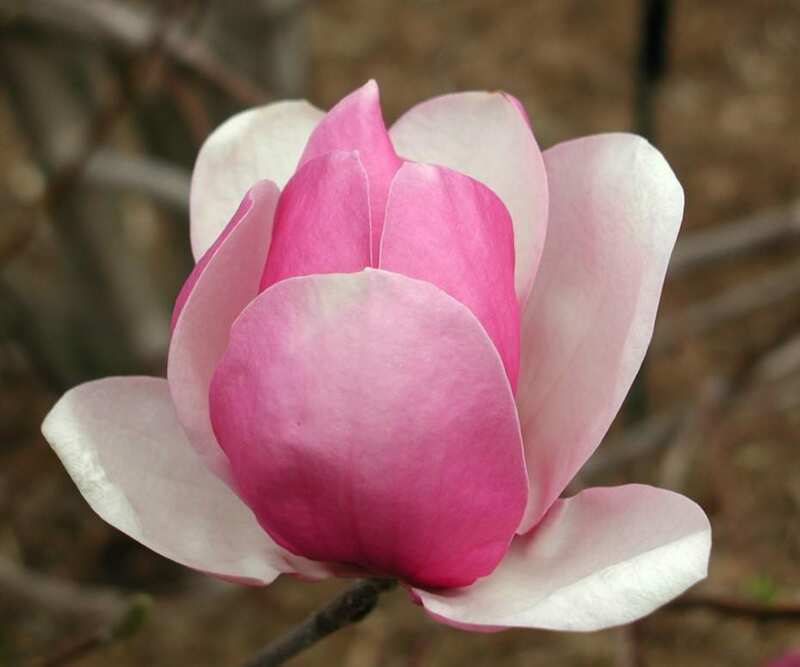 White and pink magnolias and pink cherries are in full bloom along with native dogwoods and redbuds ready to pop. Virginia bluebells, lavender and white Italian windflowers, yellow forsythia, and lavender rhododendrons can all be found blooming throughout the garden. At the March Bank, look for early spring wildflowers such as yellow bellwort, white spring beauty, and cutleaf toothwort. 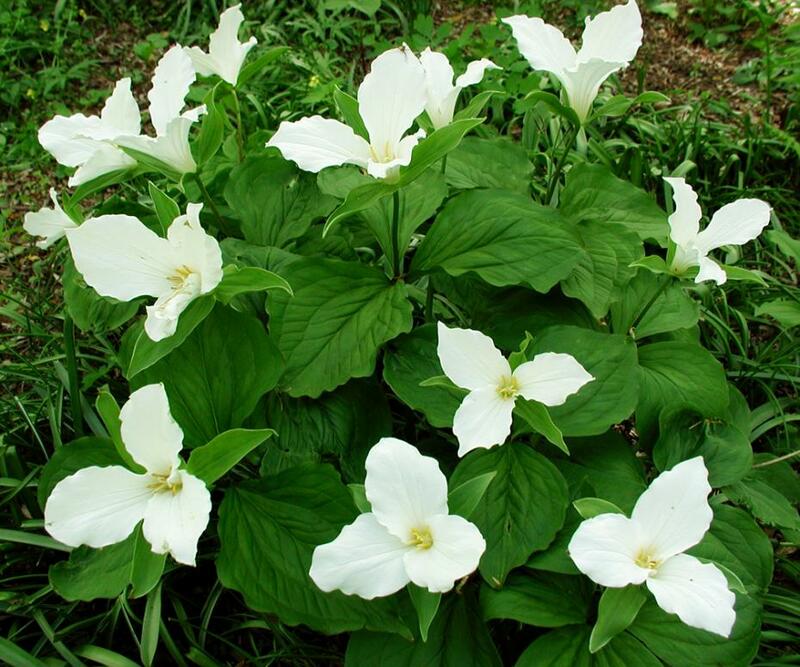 Azalea Woods is filled with white trilliums, mayapples, and yellow primroses. Make a special trip to the Sundial Garden to see blooming shrubs such as white spirea, flowering quince and early lilacs. Notice the deep pink crabapple at the edge of the Pinetum with a beautiful drift of pale blue starflower nearby. The Pinetum has flowering quince in shades of pink, red and white. 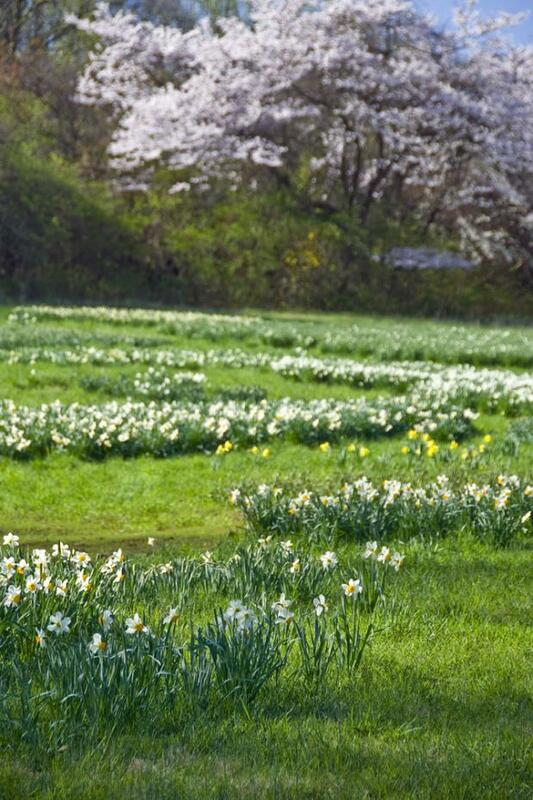 There are spectacular drifts of daffodils along the Front Drive and also at Magnolia Bend and Sycamore Hill. 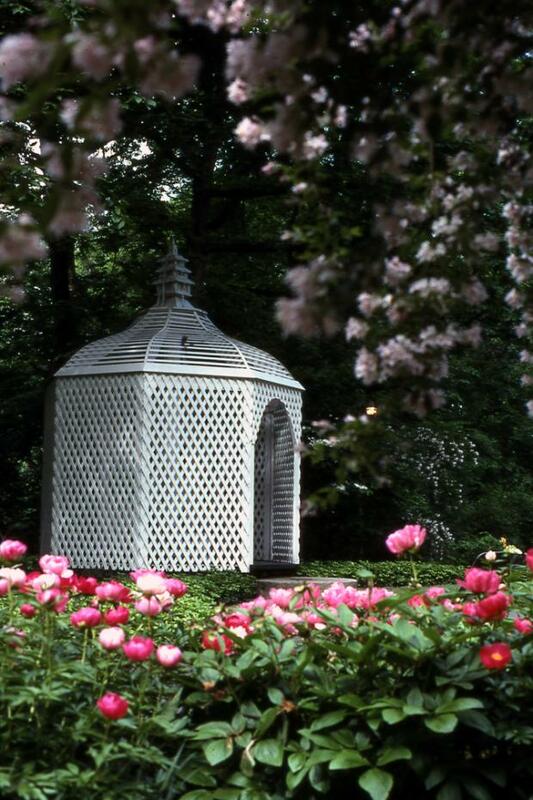 Spring is a great time to come and enjoy the Winterthur Garden! 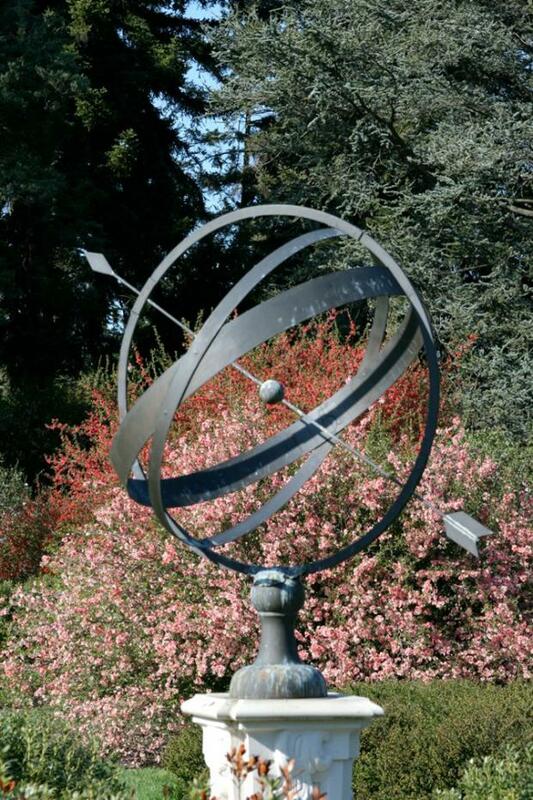 Spring is in full bloom in the garden, and at the center of it all is the Sundial Garden. The lavender of the beginning blossoms of the lilacs is combined with a sea of pinks and whites as spiraeas, rhododendrons, cherries, viburnums, and crabapples are all in full bloom. From here take a walk toward the Pinetum to enjoy the sweet fragrance of the Viburnum carlesii and the many shades of flowering quince that soften the path. In the Pinetum, the shade from the ancient evergreens is brightened by white spireas and pearlbushes and delicate pink royal azaleas. At the Quarry Garden there are many bulbs still in bloom with the primroses just starting to flower. There are color and surprises to be found throughout the garden with redbuds, Virginia bluebells, and trilliums in full bloom, and the beloved dogwoods starting to come into flower. Spring is in full swing in the garden with the lavender redbuds and pink and white dogwoods in full bloom along with azaleas just beginning to flower. Azalea Woods and the March Bank are alive with white spring beauties. Also in bloom are Virginia bluebells, white and blue Italian windflower, yellow and white trilliums, blue Jacob's ladder, and lavender phlox. The Sundial Garden is at its peak with cascading white spirea, fragrant viburnums and lilacs. 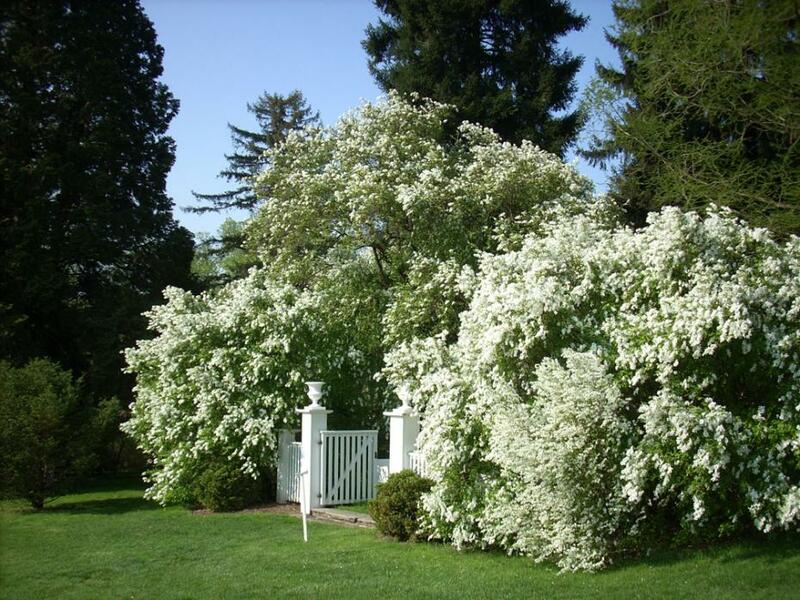 In the Pinetum there are magnificent white pearlbushes and crabapples coming into bloom. The azaleas will be at their peak of bloom in the next week or two, but there is a great deal to see all through the garden. The garden is absolutely filled with color this week as the dogwoods, viburnums, rhododendrons, and azaleas are in full bloom across the estate. 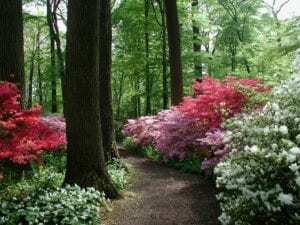 The finest azalea show, however, continues in Azalea Woods, where eight acres of white, coral, pink, and red cultivars remain in full flower along with peach and salmon rhododendrons. These colors are set off by the lavender of phlox and Spanish bluebells in flower on the woodland floor. Azalea Woods should be at its peak for at least another week. In the Sundial Garden the theme remains white and lavender with snowball viburnums, lilacs, and the princess trees in bloom. 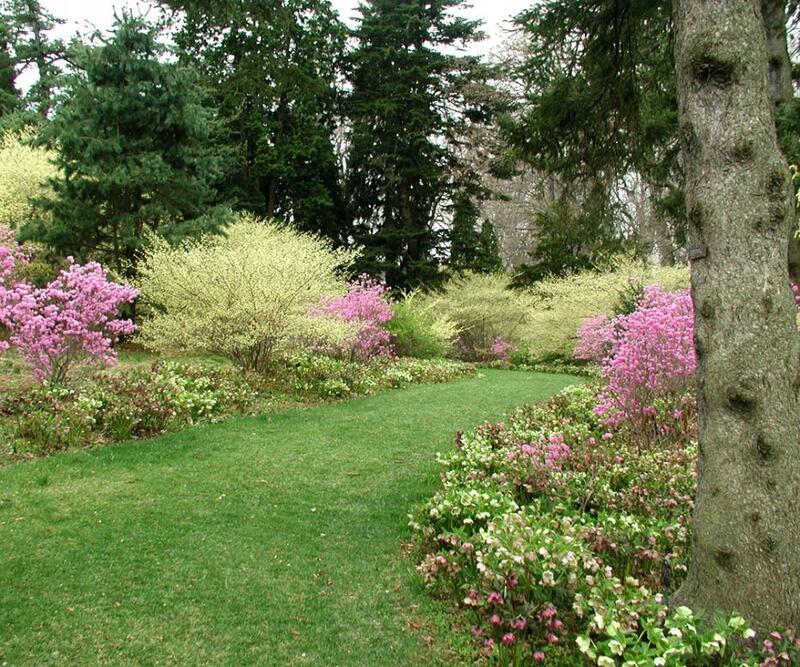 Nearby, in the Pinetum, the deep shade of the mature evergreens is enlivened by white spireas and pink azaleas. On Oak Hill, bright reds of azaleas and the flame buckeye are paired with lilacs and gold, white, and pink native azaleas, many of which are also quite fragrant. The azaleas are still making a show in every part of Winterthur. Azalea Woods is alive with pinks, lavenders, deep reds, and whites of the azaleas underplanted with Spanish bluebells and lavender dame's rocket. In the Peony Garden are many early peonies in soft ivory, salmon yellow and red as well as pink weigela. The Quarry Garden is reaching its peak bloom with wild columbines and early primulas in shades of yellow, orange, and pink. In the Sundial Garden, Sycamore Hill, and Oak Hill areas, the last fragrant lilacs still bloom along with white snowball viburnums. 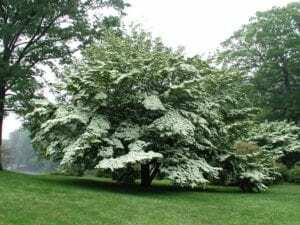 Sycamore Hill is at its peak of bloom in June, when kousa dogwoods with their white star-like blossoms, pink spirea, white deutzias, and lavender lilacs all come into bloom. Primroses are still colorful at the Quarry Garden in shades of yellow, pink, and orange. Throughout Winterthur, late azaleas and rhododendrons add their colors to the landscape. Arching sprays of deutzia and spirea are complemented by blue and white iris at Magnolia Bend. Be sure to take a stroll and enjoy the interesting textures of ferns, hostas, daylilies and other delights of the Winterthur woodlands. As summer begins, the Quarry Garden is full of color with primroses in shades of orange, yellow and lavender. At Magnolia Bend white roses are paired with pink azaleas. The deep shade March Bank is brightened by orange daylilies, white spikes of the bugbanes, and the many shades of green ferns. Throughout the woodlands, color can be found in late-blooming azaleas, lilies, bugbanes, hostas, and hydrangeas. As summer marches on, the Winterthur woodlands are alive with the blooms of hybrid daylilies and the delicate whites of joe-pye-weed and bugbane. At Magnolia Bend, the whites of the oakleaf hydrangeas are paired with the whte blossoms of rugosa roses. In the Quarry Garden amid the soothing sounds of natural springs and meandering streams, you can enjoy astilbes, iris, white bellflowers, and rudbeckia in full flower along with hostas that are just starting to bloom. The Glade, refreshing with the waterfall and fish pools, is surrounded by hostas and hydrangeas. Nearby, the Reflecting Pool is surrounded with containers filled with colorful summer annuals.. And as the summer progresses, the streambanks and wetlands of the estate seem to change every week as native wildflowers come in and out of bloom. 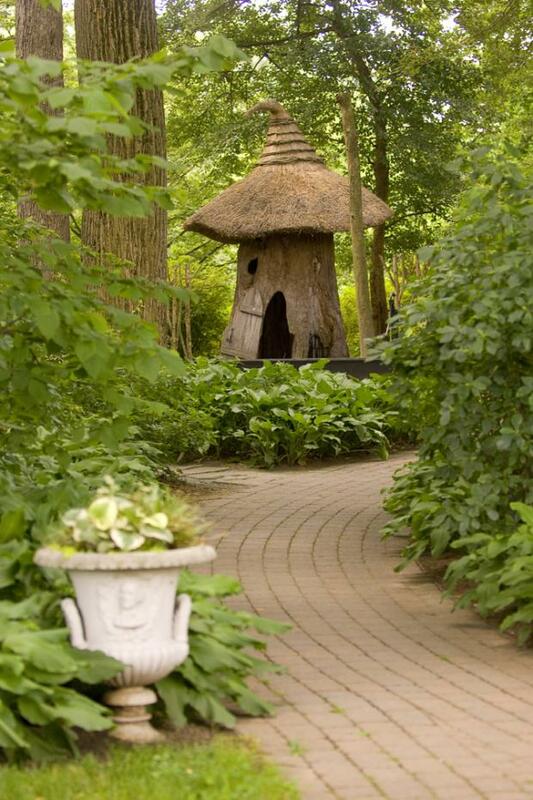 This month is a perfect time to come and enjoy the Winterthur Garden. 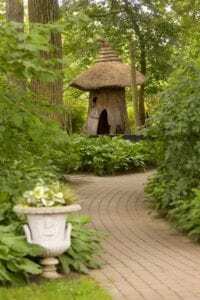 A walk through the woodland areas of Azalea Woods, March Bank, Enchanted Woods, and the Quarry Garden offer views of ferns, hostas, joe-pye-weed, and other plants with interesting foliage and textures or just a quiet place to sit and enjoy the sights and sounds of the garden. At the Reflecting Pool, you can sit and relax to the cooling sounds of the pool or catch a glimpse of the fish in the Glade pond. 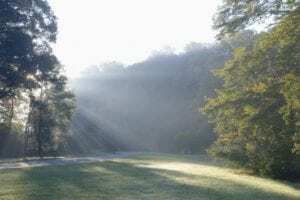 Venture out to the meadows of Winterthur and investigate the wildlife and various plants there and also the beautiful views of the surrounding hills. In the first weeks of August, you will find red cardinal flower in bloom at the Quarry Garden and at Magnolia Bend, lavender Russian sage and blue plumbago still making a show. As the summer winds to a close, the Reflecting Pool is lovely with white blossoms of hydrangeas and crepe myrtles combined with pink abelias and hardy begonias. The Quarry Garden woodlands are filled with aster, hosta, and Heuchera species in full flower. And down in the bog, there are bright yellow ligularias, blue and scarlet lobelias, and light blue clematis in bloom. At Magnolia Bend there are white rugosa roses along with the blues of Russian sage and plumbago. Throughout the garden there are sights to see as crimson viburnum fruits ripen and foliage takes an early turn toward autumn. The glorious peak of fall color should arrive in late October.. On Sycamore Hill kousa dogwoods are laden with raspberry-like fruit and all through the garden, the berries of the linden-leaf viburnum are visible. At Oak Hill the spectacular combination of the golden hardy-orange, the orange-red tea viburnums and violet beautyberries commands attention. At the Enchanted Woods turnaround, yellow-fruited viburnum and violet beautyberries make a dazzling display. Near the Post Office, white Heptacodium are underplanted with white-flowering liriope, or lily-turf. Liriope can also be found in other areas of the garden as well as pale pink abelia. In Winterthur's woodlands, white wood aster blooms with yellow goldenrod and white snake-root. 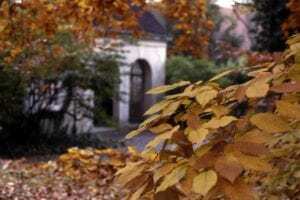 In late autumn, color in the Winterthur landscape is somewhat muted but with some vivid highlights. The view of the surrounding woodlands and the garden from such areas as the front drive, Oak Hill, Magnolia Bend, and the back drive are simply breathtaking. 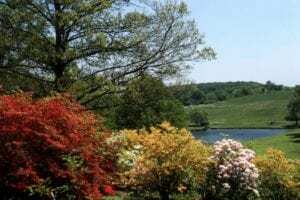 A few areas not to be missed are Oak Hill with bronze photinias and kousa dogwoods, the Quarry Garden with the reds of the black gum trees and dogwoods and rust-colored witch-hazels and the Winterhazel Walk with the beautiful combination of the golden winter-hazel and crimson azalea foliage. Be sure to see the spectacular orange-red Japanese maples at the Visitor Center and Magnolia Bend. In addition to foliage color, fruit color plays a part in our fall display. At the Enchanted Woods turnaround, catch a glimpse of the collections of purple and white beautyberries, and yellow-fruited viburnums. 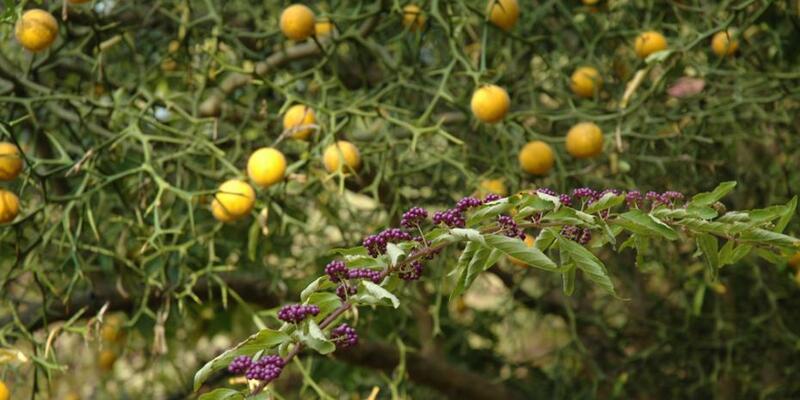 And on Oak Hill, there is the combination of yellow hardy-oranges, purple beautyberries, and red-orange tea viburnums. As autumn comes to a close, take this last time to enjoy a relaxing stroll through the Winterthur Garden. Begun in 1902, when H. F. du Pont was 22, March Bank is the oldest surviving garden area at Winterthur. Du Pont studied The Wild Garden (1904) and other writings by British horticulturists William Robinson and Gertrude Jekyll. 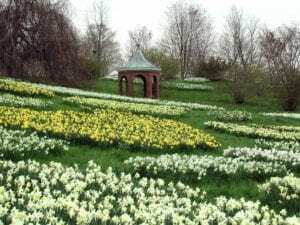 Using these ideas, du Pont began naturalizing daffodils on the bank and by the 1940s had planted thousands of snowdrops, snowflakes, crocus, squills, and glory-of-the-snow. 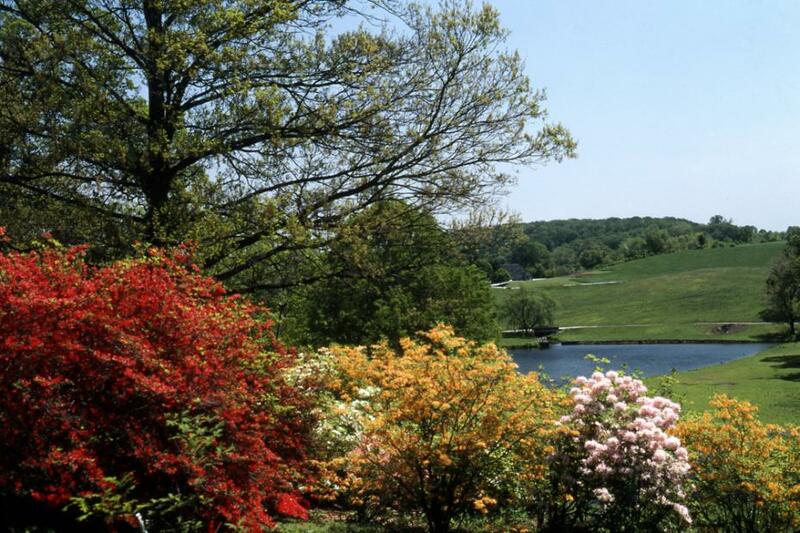 The eight-acre Azaleas Woods is H. F. du Pont’s masterpiece of color, harmony, and naturalistic design. 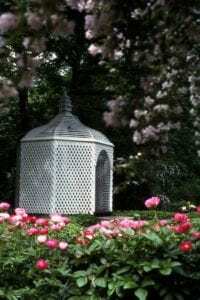 Beneath a towering canopy of white oaks, tulip-poplars and American beeches he planted white flowering dogwoods and hundreds of white, pink, lavender, salmon, and red azaleas and rhododendrons. The contrasting color combination of yellow winterhazels and rosy-lavender Korean rhododendrons presents a colorful display in early April. Many perennials, including corydalis, primroses, and hellebores bloom in shades of the larger shrubs. Designed as an April garden by landscape architect Marian Coffin, this charming area originally was the site of the croquet lawn and tennis courts. Fragrant heirloom plants in shades of pink, white, and lavender form concentric circles around a central armillary sundial. This area features a grove of stately saucer magnolias, some planted as early as 1875 by Henry Algernon du Pont. echoing colors and textures from surrounding plantings. This rich collection of conifers, or cone-bearing trees, includes pines, firs, spruces, cedars, and their relatives. H. F. du Pont’s father, Henry Algernon du Pont, began the Pinetum in 1914. A notable collection of flowering quince forms a floral corridor beneath the evergreens. Stroll along the grass paths that afford spectacular views of the surrounding countryside and pond below. Drifts of colorful native and exotic azaleas bloom from April into summer. Lavender colchicum carpet the hill in autumn, echoed by the purple beautyberries nearby. The herbaceous and tree peonies feature a dazzling array of white, pink, red, yellow, bronze, peach, and maroon flowers in May. Originally designed as an iris garden by landscape architect Marian Coffin in 1929, it was adapted to showcase the work of Dr. A. P. Saunders, a noted peony hybridizer. This area, dominated by a venerable old sycamore, features summer-flowering shrubs and trees. Lavender lilacs, fountain buddleias, and princess trees combine with cherry red weigelas. Fragrant white mock-oranges, deutzias, magnolias, and dogwoods bloom in June. Many of these plants also offer brilliant fall foliage or colorful berries.